Mecklenburg offers a rich variety of flora and fauna. Among the top ecological areas in Germany, Mecklenburg is noted for its air and water quality. In the area around our Untergöhren base many villages and little medieval towns such as Waren and Malchow are exciting to explore. Schwerin and its famous palace is a highlight of any cruise. The Muritz-Elde Wasserstrasse connects the River Elbe to the Muritzsee and mostly follows the course of the River Elde. This river, canalised since the end of the 16th century, has retained its original rural course, making it unattractive for commercial traffic but ideal for pleasure boating. From Parchim, built between two arms of the Elde, and outstanding for its ancient centre, fortifications and half-timbered houses, cruise to Lubz and on to the great lakes of Mecklenburg. Plau dominates its lake. From the top of its 15th century tower are impressive views over tiled roofs and medieval fortifications. Then cross two smaller lakes which harbour many birds including cormorants, storks and even osprey to reach Waren and then Germany's largest lake, the Muritzsee. South of the lake is Mirow with its wooden boathouses and the charming town of Roblin. East of the lake there's Weserberg with its wooden harbour buildings, as well as Neustrelitz. Don't miss the rococo castle at Rheinsberg before heading for our base at Fürstenberg. South from Fürstenberg is Himmelpfort and moorlands whch stretch to Lychen. The Woblitz river twists its way through forests before opening out into the Grosser Lychensee - one of the major highlights in the area. Templin's ancient houses and walls give it a very romantic feel. On these varied waterways and open lakes a little more care is required than on canals. You can anchor far out in a lake in some of the purest water in Europe and enjoy idyllic and unspoilt surroundings. Pause too at one of the many fish smokehouses to enjoy an unmissable local speciality. Special Fishing Packs are available including dinghy, cold box, fishing licence etc. The Mecklenburg area is one of the finest fishing grounds in Europe, with the River Havel known for eel, zander and perch, with 20 lakes for carp, pike, burbot covered by the one permit. 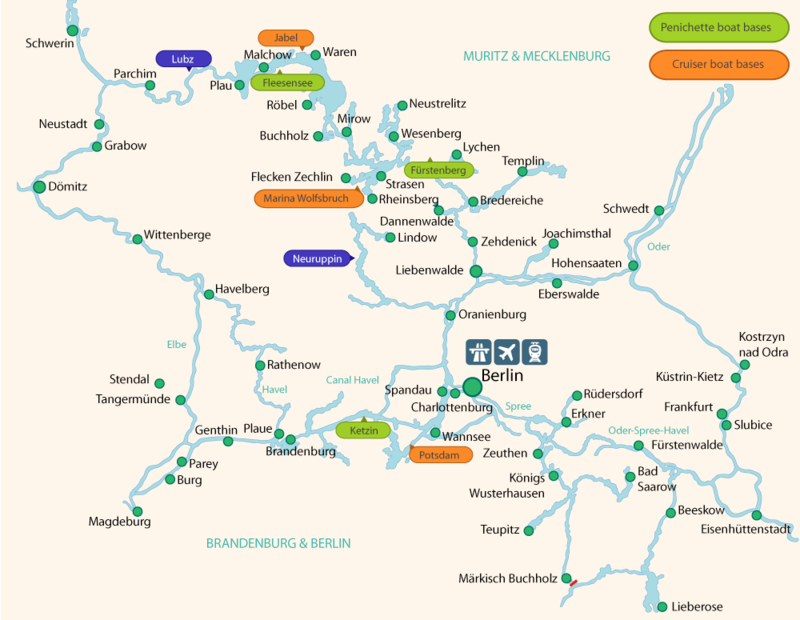 Please note that much of this area of Eastern Germany does not have an extensive tourist infrastructure. Many maps and guides may only be available in German.